The Pulsarlube is a high pressure self contained lubrication system – generating up to 850psi (58bar). The high pressure allows it to be mounted up to 8 meters away and it can push grease through a grease distribution block making it an ideal small central lube system. It is available in 3 sizes 125cc, 250cc and 500cc. A service pack containing a grease cartridge and battery pack is replaced once it is empty making it easy for the use and minimised contamination. Ideal for any industrial or mining application where large amounts of grease are desired, reliability is needed or a multipoint lubrication system required. 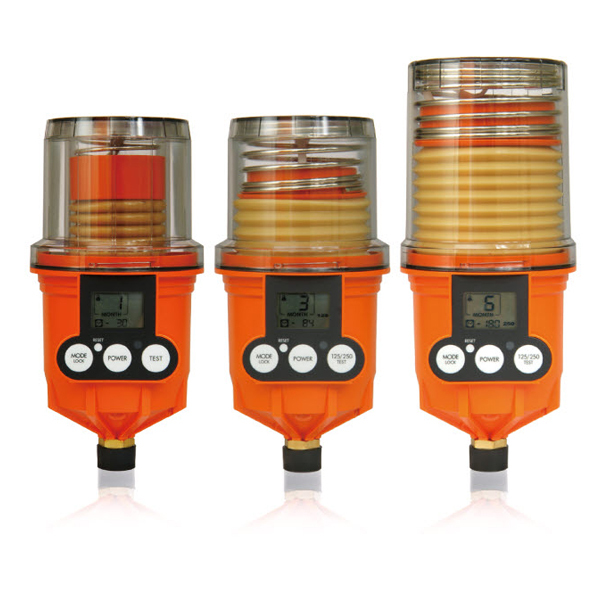 A self-contained, reusable automatic lubricator that generates upto 58 bar pressure to lubricate up to 12 lubrication points. 3 sizes available 125cc, 250cc, 500cc. Standard grease cartridges filled with BP, Castrol, Caltex, Mobil are available. Alternatively customer supplies grease and a custom fill option is available.